Standing in the doorway of an empty living room in your new apartment or home can be a daunting feeling. With so many options for furniture, accessories, and decorations to choose from, it is not always easy to know how to fill your space. Furthermore, depending on specific preferences and aesthetics, everyone will want something a little different to make their home feel like home. And with different spatial limitations, some living rooms can accommodate different furniture than others. Still, there are some living room essentials that we feel can and should be incorporated into nearly any space. From living room furniture to entertainment options to accessories and decorations, this living room essentials checklist will help you decide what you do and don’t need in your home. Read on for more! By far the most important category of living room decor is the furniture. Furniture takes up the most space and therefore is often the first thing someone will notice when they walk into your living room. While there are many different possible configurations, we believe some living room furniture is simply essential to any home. This section will include an array of living room furniture ideas and some information on these staples. You guessed it. Probably the single most important piece of furniture in any living room is the sofa. Couches tend to be the largest and most expensive pieces you will buy, and we all know how important it is to have a comfy place to rest our bodies after a long day. Furthermore, everything else in the room tends to revolve around the sofa - so this is a good place to start shopping for living room furniture in order to set a benchmark for both budget and style. The first step in picking a sofa is functionality. You must consider questions like ‘how many people do I want to be able to fit on this couch?’ If you are a large family, a sectional might be the right way to go. If you are a bachelor living in a bachelor pad or couple living in a smaller apartment, a smaller, solid piece is probably more sensible. Furthermore, wear and tear is something to take into account when choosing a sofa. Do you have pets? Children? Do you host parties often? All of these questions are very important to consider when choosing an upholstery. Different upholsteries have different maintenance and cleaning requirements, and some will stain more easily than others. Ask a knowledgeable professional about the upholstery before buying a sofa. Once you have found a few options for sofas that meet your functional needs, ask yourself whether the style suits your home. Remember that most sofas are kept between five and ten years, so try to think long-term and don’t get too sucked into the latest style trends. 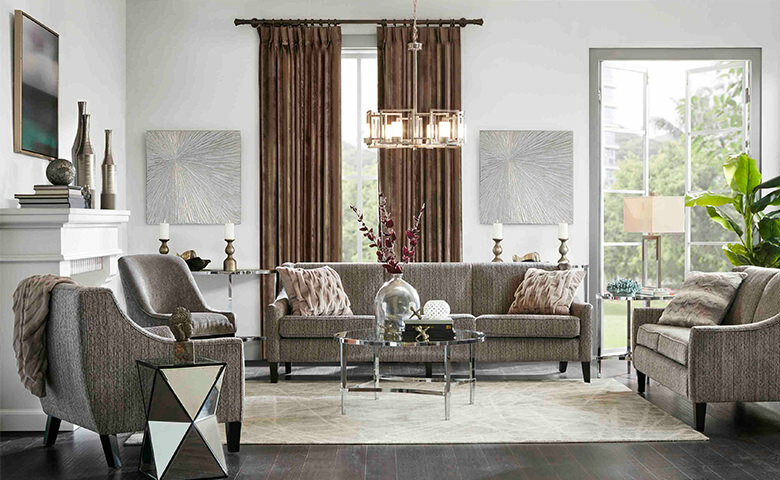 Also, consider what type of style trend you are setting for your living room by purchasing a specific sofa, and think about whether you will be able to build a stylish and functional living room around this piece. Finally, the most important piece of advice for shoppers looking for a new sofa is: try it out! If you don’t melt into the cushions in just the right way, is this really the couch for you? Read more about how to choose the right sofa for your living room in our related article. So, you’ve chosen your sofa. You are off to a great start and now have the centerpiece of your living room in place! What’s next? Many people love coffee tables because they provide a central surface area for glasses, magazines, TV remotes, etc. However, some prefer a more ‘open’ feel to their living room and opt to go with end tables rather than a coffee table. 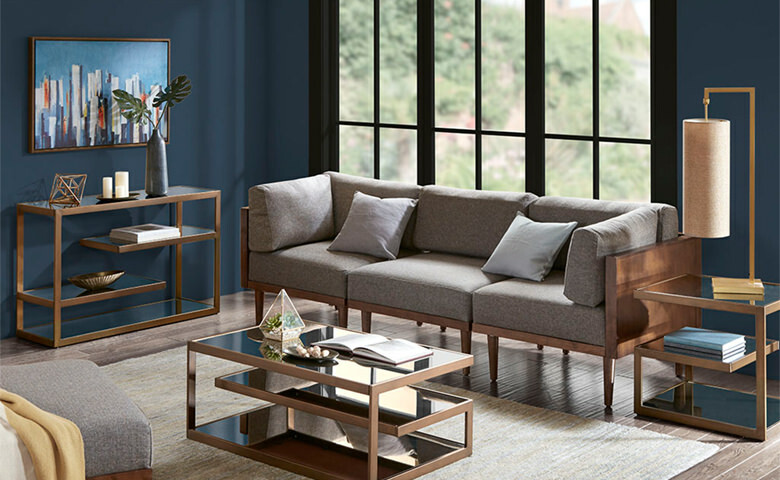 This is truly a matter of personal preference, but we think coffee tables tend to bring a living room together without overwhelming the space. Check out our guide on how to choose the right coffee table for you living room. Coffee tables come in many shapes and sizes, and you will need to consider your sofa and the size of the room when making this decision. Large, long sofas usually work best with long oval or rectangular tables while modern sofas or large wrap-around sectionals can incorporate a square or circular table. Additionally, a round coffee table can ‘soften up’ a room with a lot of harsh, square lines. Height is an important factor in choosing a coffee table. If your table is too high or too short, it will interact awkwardly with your sofa and create functional and stylistic incongruences. To play it safe, choose a coffee table that is the same height or slightly taller than your sofa seat. For a more laid-back feel, try a table that is slightly lower. Functionality and style preference are the two main factors to account for when choosing a material for your coffee table. If you have small children, perhaps glass should be avoided. If you don’t usually use coasters, maybe steer away from the beautifully-finished walnut. Make sure to choose a coffee table material that not only looks and feels great alongside the other pieces in your living room but also makes sense functionally. Some pieces are slightly more optional than a sofa and a coffee table, but still very commonly occurring in most homes. 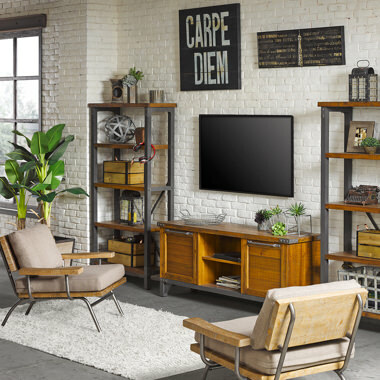 Whether to include these pieces in your living room will depend mostly on space, functional needs, budget, and style preference. 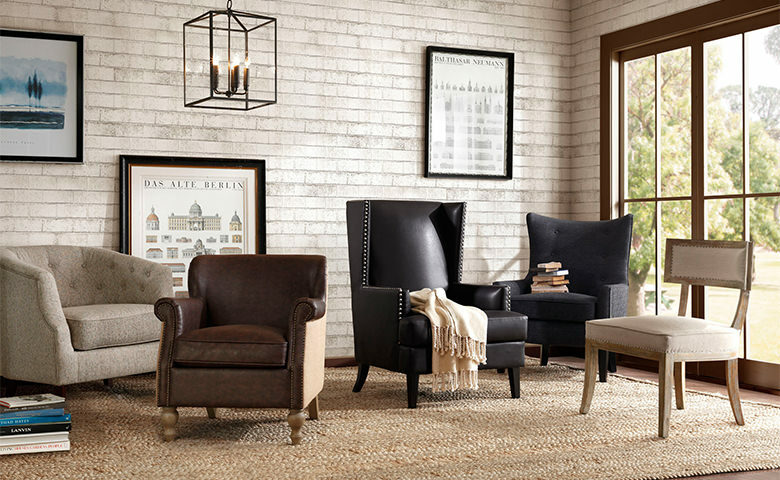 Accent chairs and recliners are great ways to provide more seating for your guests in a living room. They should be added after a sofa, because their style must complement that of your sofa. Some ‘sofa chairs’ come as part of a set with your sofa, so you might consider making your life easier by choosing this option. Alternatively, adding chairs is a great option so long as you coordinate their style with that of your sofa. In addition, make sure to plan ahead when considering where you might place the chairs. You don’t want your living room to feel too cramped, but conversely, adding chairs is a great way to fill extra negative space. Our article on The Best Accent Chairs for Your Living Room provides a perfect guide to finding chairs that best fit your unique style and space. For most homes, the TV is the focal point of the living room. From TV stands, to entertainment fireplaces, to full entertainment centers, the options for how to house your TV can be overwhelming. We recommend choosing a media console that blends well into the room while providing all the functionality you need. Remember to choose a unit that fits your TV, and be sure to consider whether you will be wall-mounting your television or not. If you want a more hidden look, try a TV armoire - which will contain your TV in a cabinet with doors, concealing it when it is not in use. For living rooms pressed for space, try a corner unit. 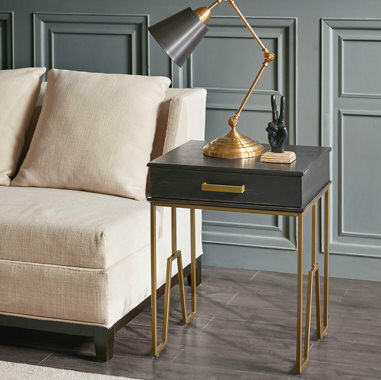 In addition to a coffee table, side tables can be a nice, seamless way to add surface area to a room. Especially for larger living rooms with longer sofas, side tables are great because they provide a space to set down drinks, etc. for people sitting on the ends of the couch away from the coffee table. Consider coordinating the color scheme and style of your living space with your coffee table, and be sure to choose a height that comfortably fits your sofa and/or chairs. Furniture is important, but it isn’t everything. By choosing the right accessories, you can take your living room to the next level. Accessories can add a huge amount of style and functionality, without breaking the bank. Here are our must-haves for your living room checklist. We believe plants belong in every living room. Aside from freshening the air by adding oxygen and absorbing harmful compounds, plants look great and pair well with nearly any furniture. Know where your plants will be in relation to windows before you buy, and be sure to get plants that are suitable for the amount of light they will be getting. Always follow maintenance and care guidelines for the species! Depending on your floor type, you may want to add a rug to add a cozy feel and a nice ambiance to your living room. Rugs help rooms to feel warm and inviting, so they are great additions to living rooms! Find one that matches the design scheme of your room. The living room is the center of your home, and no two homes are the same. What makes yours special? Consider hanging some family photos or something similar to add a personal touch and add to the warm and welcoming atmosphere in your living room. Curtains (also called drapes) are well-known for being the secret ingredient to a perfectly put-together room. Living rooms are no exception. We recommend using drapes as a way of adding character to your living room. Try a bold color or pattern that doesn’t clash with the rest of the decor but does function to liven up the room a bit. Candles are an accessory that can add a great deal of warm ambiance to a living room without costing you much money. They can be placed on coffee tables, side tables, or mantels and even without being lit they add class and warmth. Be sure to get an appropriate holder so as not to damage furniture with the hot wax. Throw blankets are an essential living room accessory. There’s nothing like cozying up to watch a movie and reaching for your favorite throw blanket to snuggle your loved ones under. Plus, by using color schemes, throws help accent your sofa and bring life into your living room. Who knew being cozy could look so good? Pillows are comfy. We all know this. Pillows in the living room? Super comfy. Adding throw pillows to your couch and chairs can be very beneficial for individuals with lower back problems, and can add coziness to any seating situation. Furthermore, accent pillows can add a vibrant flair to an otherwise dull couch or chair. 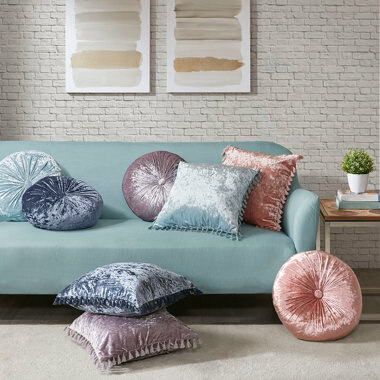 You would be surprised how much character can be added to a living room simply by adding some well-chosen pillows. Photos and artwork bring a living room together. No one likes blank walls, so consider investing some of your budget into beautiful pieces of wall art.